Nice OC with the 960T... I've always heard they are more touchy to get stable than the 965 is. Also interesting to see the 12gb memory you're running- I have never tried to OC a rig with anything other than matching pairs of RAM. I am beating my head against a wall trying to figure out why I can't get stable with a NB over 2400 once I hit 4.5ghz cpu clock. I've literally pushed the voltage as far as the board will allow, and everywhere in between. Maybe it really is time for a new project with an FX chip. have you tried unlocking it to six cores? side note/question: what is the max temp i should be hitting before i should be concerned, ive googled it and people are saying 50C but im hitting 32C @ 4.0 Ghz, is my cooler just doing a really good job? what temp monitoring program are you using? 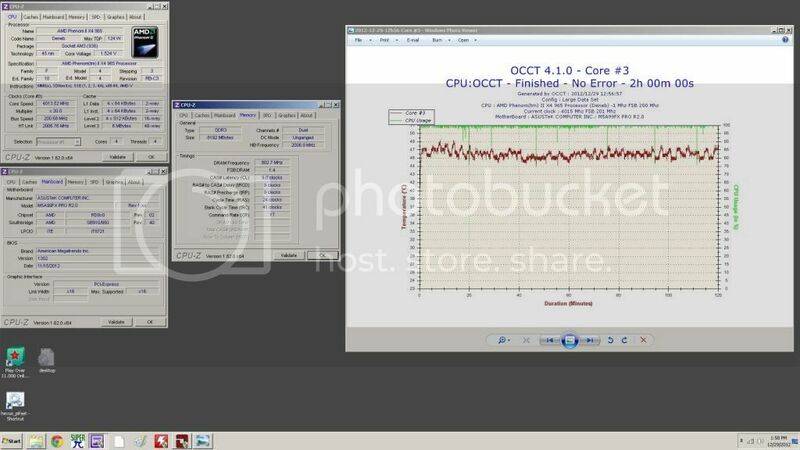 Is that 42-44C during an OCCT testing session, or just during use as monitored by OCCT? I think you're cheating a bit with the open case. Some of us have pets an don't have that option. The last time I tried that, my cat decided to take a nap inside of my NZXT 210 case, on top of the nice warm motherboard. I'm curious what sort of performance the Thuban quad cores get compared to the rest of us Denebs. 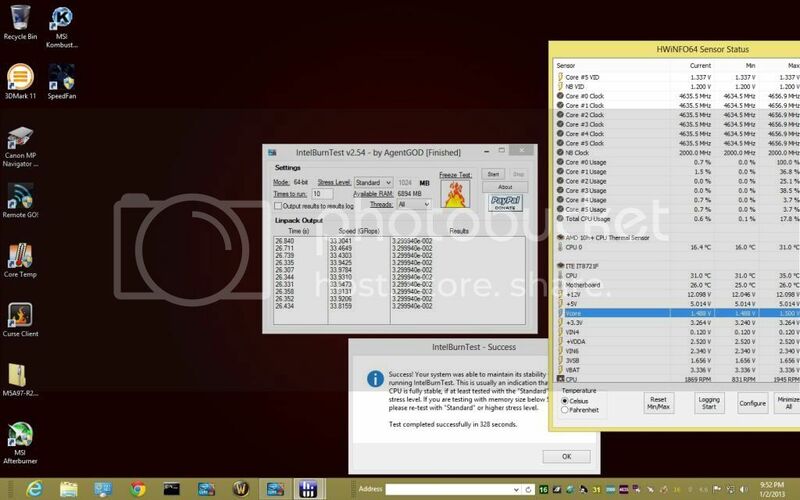 Have you tried running a 1m or 32m SuperPi benchmark? I think you're cheating a bit with the open case. Some of us have pets an don't have that option. The last time I tried that, my cat decided to take a nap inside of my NZXT 210 case, on top of the nice warm motherboard. Okay so I have to ask, when your computer case doesn't ever have a side cover, do you still use the term "intake" or "exhaust" to describe the fans, or do you even just skip that all together and just turn on the ceiling fan when you are computing heavy workloads? I got bored this morning and wanted to go out of my way to see if my M5A99FX PRO R2.0 is really as impressive as I've been saying. I overclocked it with every possible disadvantage- automatic voltage settings, Cool N Quiet enabled, fans set to "silent" speed curve in BIOS, and memory latency tighter than the factory specs. Kicked up the multi to 20x, turned on OCCT for two hours and came back. 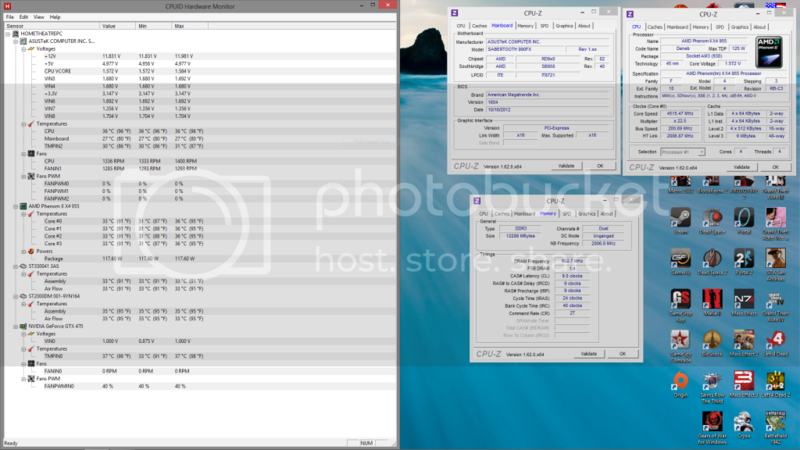 I might be more impressed with my cooler never passing 48c than with the fact the mobo breezed through it. I get about 20 mins into prime95 at 4.4Ghz and 1.59vcore (load) before it'll restart. I'm not sure I'm comfortable adding any more voltage to try and reach stability. Very nice- it's amazing how similar the voltages and such for your 955 look when held up next to my 965 overclock that also used 200mhz/22.5x with 2000mhz NB & HT speeds. That removes any doubt I had about the Sabertooth being at least on par with my M5A99FX Pro R2.0 for OC potential. What do you run at for your daily clock speed? The amazing thing is you're massive OC is with a air cooler, correct? I'm not sure why you would ever doubt the sabertooth it uses the same vrm as the crosshair V. Chances are that neither of our boards are gonna limit overclocking headroom, I'm pretty sure the cpu will do that first. I can get 4.3Ghz stable but it requires 1.56v @ load which is more than I'd prefer for everyday usage. I hadn't even caught the fact that you were liquid cooled.... yep mine is air, with the Xiagmatek Gaia that goes for $19.99 on Newegg. I don't know how i manage to keep the temps in check- good with thermal paste I guess? I will say though, of the two identical mobo/cpu setups I run, it is much easier to keep temps down with my NZXT Source 210 case (room for six 120mm case fans) compared to my Thermaltake Commander (only two 120mm fans). The part of your OC that impresses me is the NB- maybe i have just yet to work out the details, but I know for a fact that it's my NB that I always make unstable before the actual core clock. The Sabertooth would likely be what I was running in at least one machine now, except Amazon was back-ordered on the R2.0 at the exact same time they put my model on sale. It looks like an impressive piece of hardware, but if you search the web, there are definitely mixed opinions about OC potential. It probably is just owners who aren't sure what they are doing, but lots of complaints claim that the same design features which are touted as providing durability also are less than ideal for efficiency. I didn't buy it and it's not my theory, but without having owned one, I couldn't say it was bunk immediately either. I wouldn't sweat 1.56v myself on the CPU, but I do worry about the voltage to my NB. I intend on upgrading the chip far sooner than the motherboard, so frying the Phenom wouldn't be fun, but frying the board would be horrible. 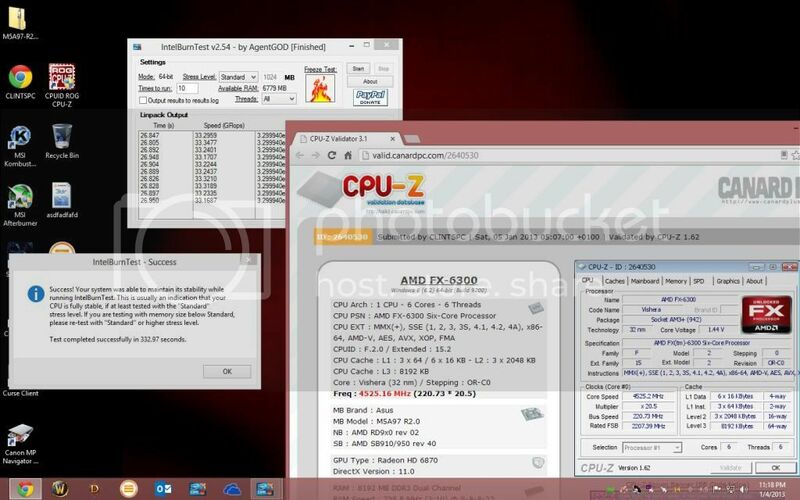 Hi All, Ill post a CPUz validation as soon as I can but I had a question. I Have ample thermal room to play with more voltage (I hit a max of 59 C after an hour of Prime95) and gaming I dont go over 50C. 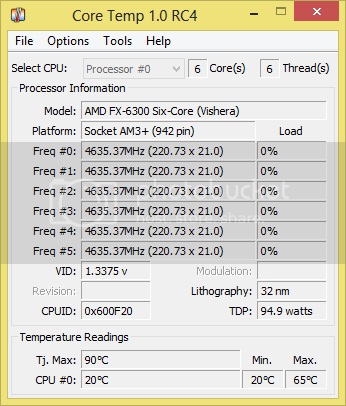 But I seem to have hit a wall at 3.74 ghz, any more and I BSOD no matter how much voltage I give it. I want to try OCing my NB to see if that helps can someone direct me to a thread that can help? Thanks. But I seem to have hit a wall at 3.74 ghz, any more and I BSOD no matter how much voltage I give it. I want to try OCing my NB to see if that helps can someone direct me to a thread that can help? Thanks. I've had the first version of the M5A97 mobo before, I might be able to offer some help. If you start a new thread, I'll be more than happy to see what I can do. Just don't want to hijack a whole page of this thread. To be brief here though, BSOD are more often than not related to the memory- seeing that you have changed your base clock speed from 200 to 231, I assume you were attempting to keep the RAM frequency around the original 1600mhz after applying the multiplier. However, the transition from 200*8x to 231*7x is often not as smooth as one would expect. You may just need to tweak your timings a hair, or up the voltage to something like 1.525 or 1.53. That's just initial speculation based on what I have to go on right now. Nice overclock clintwilks, you should push your N/B a bit farther, it should boost performance nicely. Oh and IBT is not one of the supported stress test programs, rules are all detailed in the first post. Oh my bad...im a newb when it comes to linpack. Guessing there is a thread somewhere around here i can read on how to use it. I've ran prime95 overnight on 4.50 and am doing it tonight on the 2nd OC i posted so ill have a valid one tomorrow/this morning.